Many of you know that we have two 100% V-dogs (that means they are on a 100% plant-based diet and have been for 4 years.) We make their food, and I posted that a while back. However, we also make two kinds of treats for them. 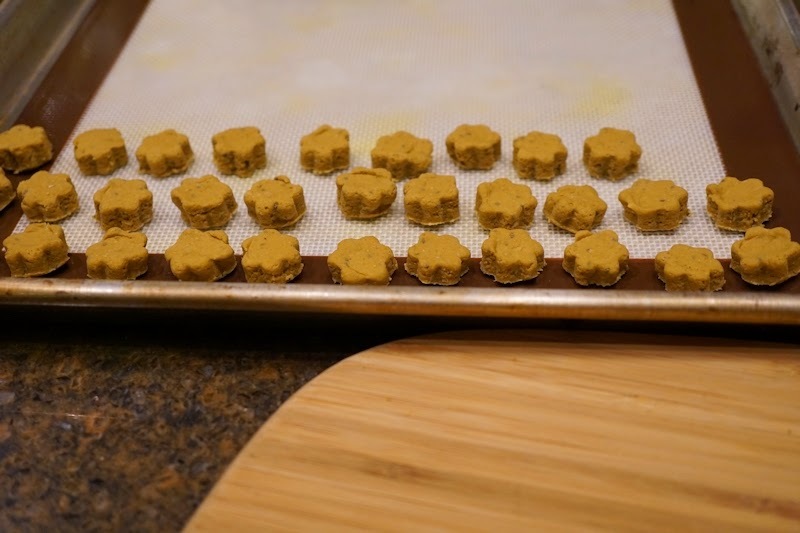 These (see photos) are mini-sized Pumpkin Chia Treats that we give them when we leave the house. They're low calorie and low-fat, but have super healthy ingredients. 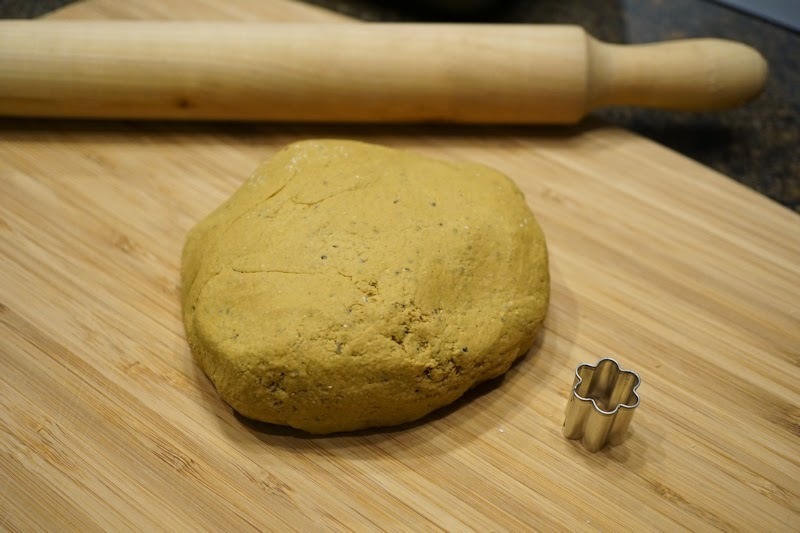 I purchased a mini cookie cutter for them, but you can make your own with a 1 or 1 1/2-inch cookie cutter instead. Just bake them 10 more minutes if their bigger and thicker. NOTE: Makes about 250 mini treats. You can half the recipe to make less or if you don't have a lot of time. Pre-heat oven to 300 degrees. Mix all ingredients in your standing mixer until it all comes together in a ball. The consistency should be sticky, but not so sticky that it sticks to your fingers much. If you need more water, add some. If you need more flour, add some. Split the dough in half and wrap one half in plastic wrap to keep it moist. Press or roll the other half out on a wooden board. Cut out treats with cookie cutter. Place on parchment or silicone-lined baking pan. Bake for 20 minutes, then turn oven off and leave them in the oven to dry out (a few hours or overnight). These can be frozen for future use. Just make sure they are cooled first.